Do you remember choosing your A-Level subjects and writing your UCAS application not knowing what to expect when eventually heading off to university to study law? We remember that feeling well — which is why we decided to volunteer for Big Voice London. We run four projects every year to help A-Level students make informed decisions at an early stage. Not only will students benefit from learning through the projects, but also from the insight Big Voice London guest speakers provide from their experience in legal education. No matter what career path you are working towards, there are certain key transferable skills that all employers are looking out for — time management, good organisational and communication skills are only a few. There are two roles at Big Voice London: coordinators, who organise and run projects, and group leaders, who teach the students. Volunteering in either role is a great way to build on the aforementioned skills because you’ll be liaising with a diverse range of people, including legal professionals, academics and sponsors. Volunteering for us while completing your studies is a tangible way to demonstrate you have these skills. Group leaders are given autonomy over the content of their sessions. The sessions are similar to university seminars and are aimed at teaching students about a particular area of law. Last year, for example, we looked at the law relating to the gig economy. Beyond this, group leaders are fully supported in designing their own curriculum and when selecting guest speakers. Abbarova particularly enjoyed tailoring the syllabus towards social media and press regulation, topics she thought were most engaging. Group leaders also assist students when compiling their final reform report for the Model Law Commission and get to have a go at editing the report that is later published by research company LexisNexis. When planning any project, we make sure to include experts in the relevant field; this is a great networking platform for our volunteers. Past speakers include leading barristers and QCs, law firm partners and university professors. 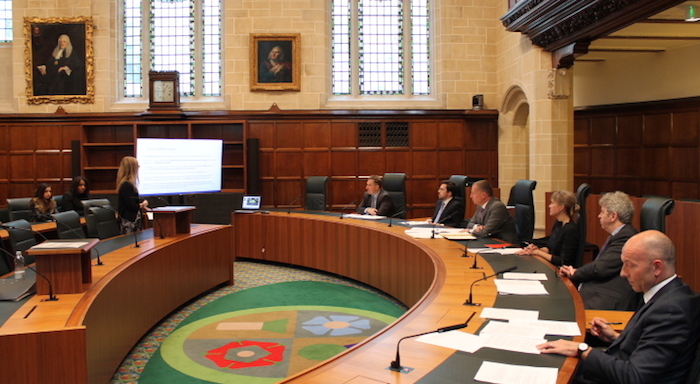 The final round of our Mooting Competition takes place in the Supreme Court, giving our volunteers (who compete alongside the students) the opportunity to receive feedback from the Justice judging the round. For the past two years, this has been Lord Kerr, while Norman Lamb MP hosted this year’s Model Law Commission final in Parliament. All our events are followed by an informal reception to encourage interaction between guests and volunteers. Our flagship project, the Model Law Commission, remains the UK’s only such project. Having the opportunity to work behind the scenes to ensure its smooth running and success has been a unique experience for us both. We truly believe there is no other organisation that offers student volunteers the same combination of self-improvement and feeling of reward, knowing that you have made a substantial impact on people’s lives. We have a select management team, and a small team of coordinators. This means you’ll have a lot of responsibility from the get-go and that your voice will be heard — we are Big Voice London after all! We started out as a student-run organisation and recognise the valuable contribution all our volunteers can provide. For example, all coordinators have a say at management board meetings and group leaders are regularly consulted to share their thoughts. It’s no secret that the legal profession is struggling with diversity and social mobility. Here at Big Voice London, we take a bottom-up approach to improving this. We hope the earlier we raise student aspirations, the sooner we are able to encourage them to pursue a legal career. For example, one student joined Big Voice London unsure whether a law degree was for him. Following his participation in our projects, he is now due to begin his law degree at Cambridge later this year. You too can be a part of these stories and this important change in the make-up of the legal community.